There are lots of fun ways to get kids involved in party planning that will help make them feel part of the process. Kids can help with party planning and preparation by creating seating placecards. After all, party planning shouldn't always fall solely on the grown-ups in the house. A festive gathering at home will, by its very nature, involve the kids in one way or another. Help them feel invested in the party by getting them involved in the party preparations. These 4 kids party planning ideas can help you get the necessary pre-party prep work done and ensure everyone is part of the process, and invested in its successful outcome. These kids party planning ideas do double duty - not only do they help with the festive decor, they're fun and easy for the kids to do, helping them become more vested in the party process. First up: Place cards. It's really handy to have place cards for any kind of sit-down dinner, even an informal one. 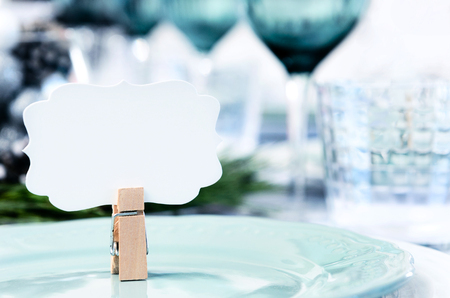 Place cards eliminate the uncomfortable where-do-you-want-everyone-to-sit dance. This is a definite enlist-the-kids project. Have them paint the little cards gold or apply sticker decorations. Or, make it even easier with tiny blackboard stands older kids can write guests' names on. Use first and last names (John Smith), titles and names (Dr. Musto), or simply nicknames (Grams and Gramps) for more intimate affairs. Place the cards on top of or in the napkin's center. Better yet, place them on the tablecloth at the exact center of each place setting. Have kids create leafy place mats. They're perfect for fall gatherings. Start by gathering a variety of leaves of different sizes, shapes, and textures. Position white paper placemats over the leaves. With a peeled crayon, lightly rub the top of each place mat until the outline of the underlying leaf appears. Repeat with other leaves and different colors of crayons until you have a festive pattern. Cover the paper placemats with plastic and enjoy. You might want to make some for the grandparents, too. Even if you're not eating a sit-down meal at the dining room table, a centerpiece is a lovely decoration. You can tie it into your theme! Get your kids to help brainstorm ideas. Whether you choose flowers or fruit, your centerpiece is one of the most important pieces of your table setting. Create or order yours well in advance, and, if you ordered it, pick it up the morning of your party. As the name implies, place your centerpiece in the exact center of the table. Casual parties are often outside, or else they eventually spill outside, so make sure your patio and all the patio furniture is clean. Kids can help with patio cleaning - get a full list of age-appropriate patio chores for kids here. Wash off glass tables. Make sure the umbrella is operational. Put out enough chairs so that people can rest somewhere. Arrange potted plants in nice groupings.